Michael Findlater engages in what has been called modern-day alchemy. This is not the centuries-old scheme to turn iron into gold, but a chemical sleight of hand that tricks inexpensive, readily available materials into behaving like scarcer, more expensive ones in industrial processes. In short, these are greener, more sustainable methods of production. In the last 45 years, at least three Nobel Prizes for Chemistry have been awarded to scientists working in this field called organometallics, and there are very few areas of chemistry it hasn’t touched. 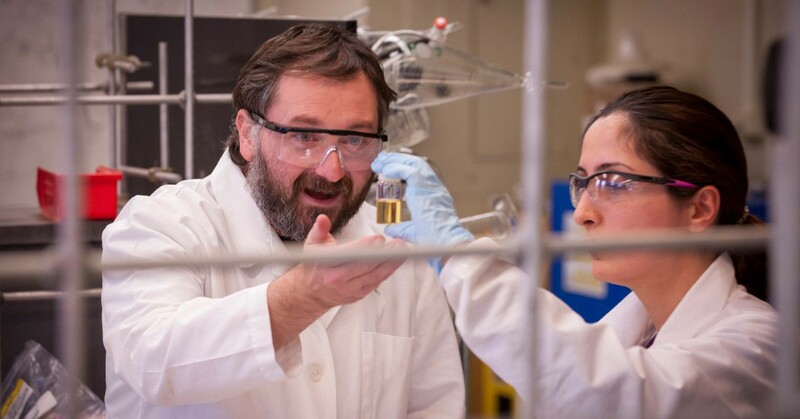 Findlater was awarded the National Science Foundation’s Faculty Early Career Development (CAREER) Award, the U.S. government’s highest award to scientists in the early stages of their research careers along with a five-year grant. His research is also supported by grants from the Robert Welch Foundation, one of the nation’s oldest and largest private funding sources for chemistry research. Former Texas Tech University System Chancellor Robert Duncan, right, and Michael Findlater during a campus ceremony recognizing Texas Tech University recipients on Jan. 25, 2018. 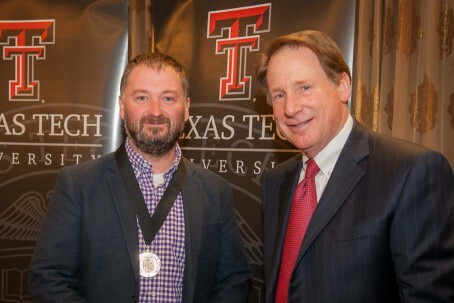 In honor of his career of achievement, Findlater was awarded the Chancellor’s Council Distinguished Research Award, the most prestigious honor given to faculty members throughout the Texas Tech University System. 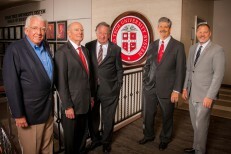 He received $5,000 and a medallion for his excellence, funded by annual membership gifts to the Chancellor’s Council — a giving society that supports the chancellor’s priorities by impacting student lives through scholarships, recognizing faculty achievement and encouraging excellence across all four system universities. 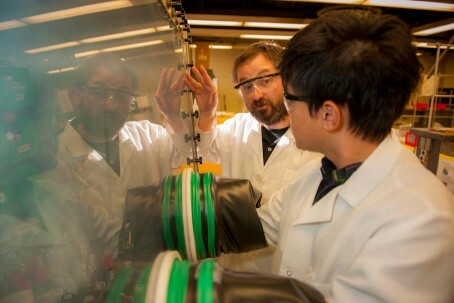 Michael Findlater, left, discusses a technique with a student working with a project inside a ventilation hood in a Texas Tech University research lab. Findlater was born in Scotland and earned his B.Sc. in Chemistry at the University of Strathcyde in Glasgow, before completing a one-year internship with Merck & Co. He decided to pursue his doctorate at The University of Texas and then took a post-doc position at The University of North Carolina at Chapel Hill. 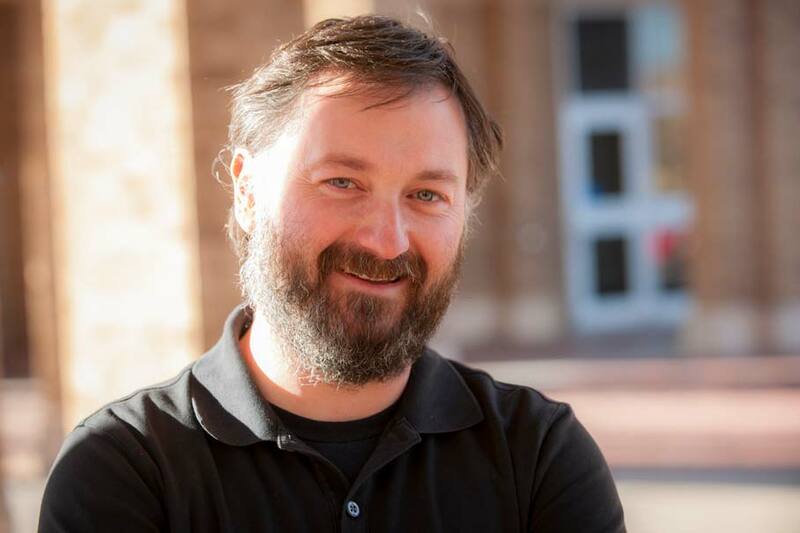 He joined the Texas Tech faculty in 2011. Broadly, Findlater works with catalytic processes, which are tied closely to sustainable chemistry. “All that means is: can we make chemical reactions more efficient?” he explained. “Can we make them go faster? Can we make them occur at a lower temperature, so we don’t have to heat something up? Can we make it in a greener way? Organometallics is playing a prominent goal in the quest for sustainable chemistry, which is the focus of Findlater’s research group. “Our expertise is in the application of metal-based catalysts to solve industrially relevant problems,” he said. 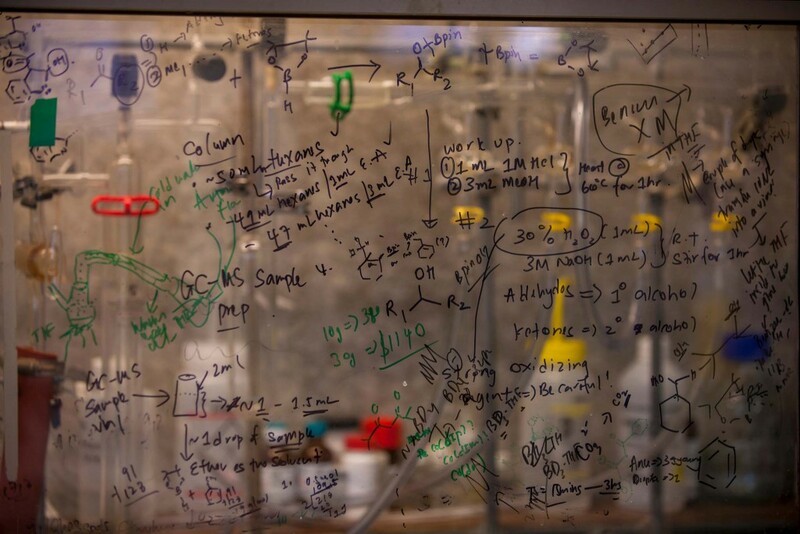 Chemical equations and notes cover a transparent surface in Michael Findlater's research lab at Texas Tech University. Many common industrial processes rely on precious metals. Findlater’s team looks for ways to avoid the expense. “One of the things we look at is replacing precious metals. For example, platinum is used in a whole range of applications. If we could do that exact same chemistry with something like iron or cobalt, there would be huge economic advantages in moving away from platinum to iron,” he said. Platinum costs approximately $1,000 per ounce, compared, for example, to iron, which costs about $50 per ton. In addition to the cost, there is the problem of heavy-metal toxicity. Platinum like other noble metals — gold, silver, palladium and iridium — are toxic. If it were possible to replace platinum with earth-abundant base metals like iron, copper, nickel and zinc, scientists point to less toxic results. This is where the modern-day alchemy comes in. It’s possible to create a new catalyst — not by transforming iron to a precious metal — but by chemically tricking it to react like one. This involves wrapping the iron molecule in an organic molecule called a ligand. The ligand changes the number of electrons available to form bonds, giving the iron the ability to act like platinum or gold. The resulting catalyst isn’t actually gold, but it acts like it. And that’s worth just as much in production plants around the world. Organometallics catalysts are better, Findlater said. In fact, some of these catalysts are so good, they could be disruptive technology and are being patented. Yet, organometallic catalysts offer flexibility in industrial processes that was previously unavailable. It’s one way Findlater and his team are pursuing greener, more sustainable, less expensive ways to produce tomorrow’s products.